Written by Lacey Budd on March 19, 2019 . Posted in Blog. February was a short month with record snowfalls, another Super Bowl win for the Patriots, and a Best Picture Oscar for Green Book. Now that spring is here, we’re excited to share the many improvements we’ve made for you in February. We know that some of you send more than just email, so we want to provide a dashboard experience that better represents that. 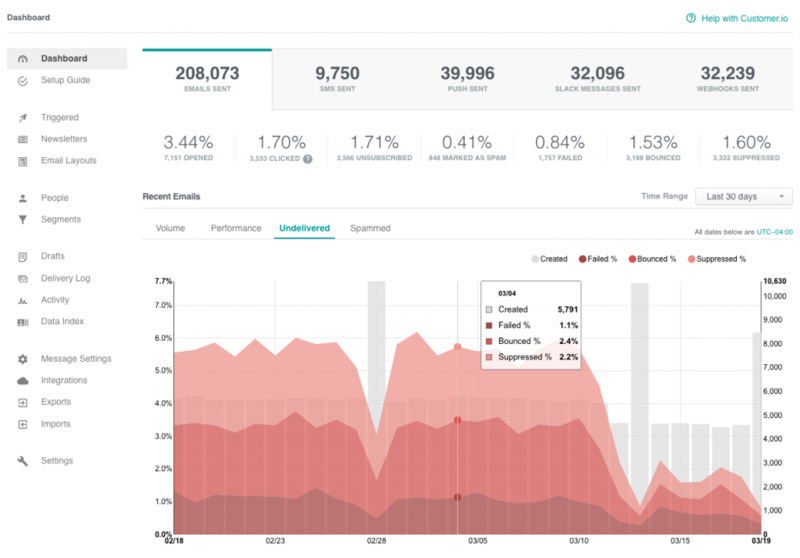 You can now see metrics for all channels in a single view. This includes email, SMS, push, slack, and webhooks. In addition to measuring volume and performance, we’ve added two more chart types—undelivered and spammed. The new Undelivered chart helps you understand how frequently Customer.io is unable to send messages. It shows the number of messages created and a stacked line graph visualizing the failed, bounced, and suppressed rates. Undelivered metrics are available for all channels. The new Spammed chart helps you understand your email spam rate over time relative to when you’re doing the highest volume of sending. It presents the number of messages sent with a vertical bar, overlaid by a line graph showing the spammed rate. 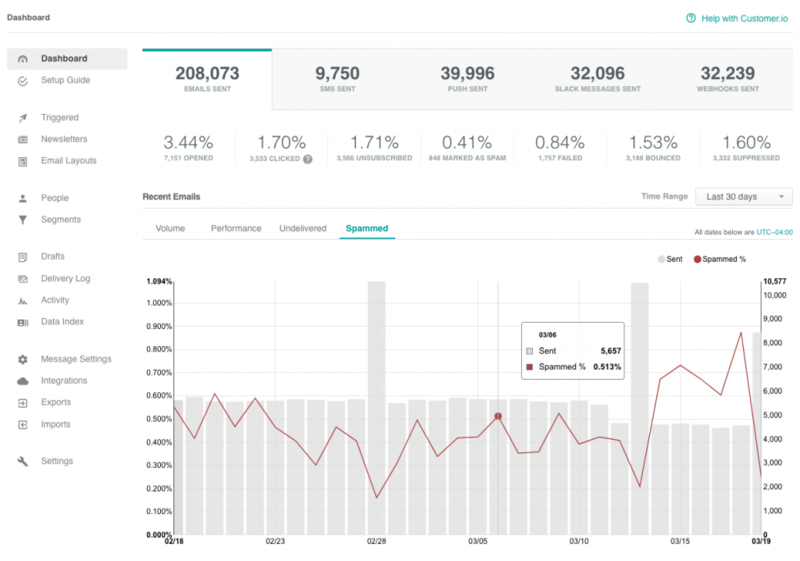 Viewing these metrics in your dashboard will help alert you to any potential issues such as spikes, and you can easily see if these types of messages are decreasing over time. Say good-bye to unwanted emails within a short period of time. Our new addition Frequency allows you to limit the number of times a person can enter an event-triggered campaign. You have an abandoned cart campaign that’s triggered by an event that is sent every time your customer adds an item to the cart. The workflow for a campaign triggered by that event waits 5 hours to see if the purchase was completed. If not, you send a nudge email. Rather than sending multiple times a day when the event occurs, you select the Frequency to only have it sent once per 24-hours. Want to know if a person’s devices are working correctly? The “Last Result” column will let you know if Customer.io was able to successfully reach each device. When a Push Notification to an iOS or Android device fails, we now make it easier to understand exactly what’s happening. If a Push Notification fails because the token is unusable or has expired (generally due to an app being uninstalled) we will mark it as Bounced. Future attempts to send to that device will be Suppressed until you’ve re-registered the token via the add device API. If a Push Notification fails because no devices are present, we mark it Undeliverable. These new statuses help you quickly distinguish when a failure is caused by your campaign configuration or is a result of your customer’s device status. The UI on both the Delivery Log and the Delivery Summary pages were improved to make these statuses easy to follow. We reviewed every error message that the push providers send us and make sure to show you a message with an actionable next step any time you see a failure. If someone entered a campaign by mistake, you can now manually eject them from the active campaign. You’ll find a button on the person’s Journey page for the campaign you want to boot them from. Is a customer complaining they didn’t get a message? We’ve added a “Resend” button for any previously sent email. This creates a brand new copy of the message and sends it again. You are now able to access Journeys for deleted campaigns so you can understand how people experienced your old campaigns. Added default segments to represent the groups of people who have or have not registered mobile devices for push notifications. Use these to help determine when you should send a push or an email. Replaced the “Date” column with “Date Created” for Delivery Logs so it’s now clear when each item was created, and sorted by most recent. Action Conditions UI is updated to make it clearer that they are checked before running the Action. Increased the maximum URL length for reporting webhooks and improved the validation and error messages provided when we detect problems. If you use Oracle DYN for Custom SMTP, your emails now correctly show Bounced and Spammed statuses. What you don’t see within these new releases are several exciting early-stage projects on our path toward building the most powerful automated messaging tool. Just wait until you see what we have in store for March! In the meantime, stay updated with the latest releases and improvements by following Customer.io on Twitter. Questions? Comments? Send them over to win@customer.io. P.S. Did you notice anything different this month? We have a new look! You’ll now see our new logo in the product with bigger UI changes in the coming months. Written by Lacey Budd on February 12, 2019 . Posted in Blog. In April 2013, we launched Customer.io’s logo you’re all familiar with. This logo has served the company well. Almost six years later, we decided it was time to reimagine Customer.io as our company and product have evolved. Starting today, you’ll see a new logo, color palette, and an updated website. Over the coming months, we’ll be refreshing the product to reflect our new look. Our mission is to power automated communication that people like to receive. We wanted the logo to convey elation. Elation that we want you to have using our product, and elation when people receive the messages you send through Customer.io. Why Create a New Logo? When starting this project, we knew our logo and branding should remove our association with email, modernize our color palette (partly to make accessibility easier to achieve), and put more of an emphasis on people. A company’s logo and branding should be aspirational. We wanted a makeover to show the world who we’re trying to be rather than who we were a few years ago. The mark represents the customer with raised hands in victory. The raised arms mimic the “C” in Customer.io and suggest a smile. The logotype is rounded to reflect the smile in the logo. We have a brighter color palette—we maintained our signature teal but switched our primary brand color to purple for better accessibility. We are excited to start using this logo everywhere that you see Customer.io! Tweet us and share your thoughts on our rebrand. We also have lots of stickers with our new logo, so DM us or email press@customer.io to get yours! Partners, please visit our press page to download our new logo and brand guidelines. Written by Lacey Budd on January 22, 2019 . Posted in Blog. Have you ever wanted users to wait in your campaign workflow until they take an action? Well, you now have that option with Wait Until. Instead of creating multiple campaigns when you need to wait for a user action, Wait Until allows you to have a single campaign flow that captures all your logic. Wait Until they’ve opened the previous email before sending the next one. Wait Until the product has been delivered before prompting a product review. Subscription canceled due to an expiring card. Wait until payment details are updated before sending a “welcome back” email. In addition to a time delay, you can now Wait Until someone enters (or leaves) a segment before they continue through your workflow. When you deliver messages based on actions rather than time, you’ll increase your open rates and better serve your users by decreasing the number of messages you send. You don’t have to stitch together metrics from multiple campaigns to understand what’s going on. You get to see conversion metrics for the entire flow rather than piecing together each one individually. You have an onboarding campaign where you’d like to send an email confirmation and welcome email. Instead of creating two campaigns (one for each user event), you can keep the entire email confirmation flow in one place. This means that some users may wait for a few minutes before receiving the next message, some may wait days, while others may wait indefinitely if they do not confirm their email. See step-by-step documentation on how to create, delete, and copy Wait Until delays. What do you love or wish we had done differently about this new feature? What things do you wait for? We’d love to hear your stories! As always, we’re here to listen if you have questions or need help by reaching out to win@customer.io! Stay updated with the latest releases and improvements by following Customer.io on Twitter. Written by Lacey Budd on January 9, 2019 . Posted in Blog. More than 14,000 people from 1,100+ companies used Customer.io to send 5.5 billion messages in 2018. That’s 174 messages sent every second! This past year we focused on making major improvements within the messaging and data areas of the platform. In 2018 we set out to become an every channel solution. We focused on enabling you to connect with your users where they spend the most time and on the channels they prefer. To do this, we introduced a push solution for iOS and Android, improved our multi-channel features, and made improvements to how you compose messages with Customer.io. Push Notifications. Although email is still the most used messaging channel by users, we added support for sending push notifications within your existing workflow. This allows you more opportunities to connect with your users through their preferred method. Drag-and-Drop Editor. Before the Drag-and-Drop Editor, you’d have to know HTML/CSS to manually build layouts. You can still go that route if you want, or you can use the editor to create well-designed, mobile-friendly emails without writing a single line of code. API Triggered Broadcasts. With one simple API call, you can now trigger campaigns to specific groups of people that are targeted using all your segmentation and profile data. This gives your application direct access to start campaigns, including the ability to pass in data that will be used in your messages. Multi-channel A/B Testing. We took all of the A/B testing capabilities for email and made them possible for Push and SMS. Additionally, you can now view multi-channel metrics for your entire campaign, or break it out individually for email, push, or SMS. CSV Uploader. With the CSV Uploader, you can easily import new users to your Customer.io account without needing any technical knowledge or pinging your engineering team. You can also use the uploader to update existing users by either adding, modifying, or deleting their attributes. Manual Segments. You can now use Manual segments instead of (or alongside) Data-driven segments when you need more hands-on control setting campaign recipients or excluding specific groups of people. New APIs. The API now allows you to programmatically retrieve data on your customers, campaigns, segments, and messages. There’s a lot of data inside of Customer.io—that belongs to you—so we wanted to make sure you have access to use in any way you want. Data Index. The Data Index page is a new way to view a complete list of events and attributes that exist in your Customer.io workspace. This is a great way to see where all your data is used, understand your team’s naming conventions, and view sample values. We’ll continue to release new features in 2019 to help you have the most successful year possible. Want to know what else Customer.io did in 2018 besides release these amazing new features? Check out our 2018 year in review to read all of our Company highlights including our new vision/mission/strategy work and design improvements rolling out this year.